This was the second broadcast of Myoujin WiFi Radio. 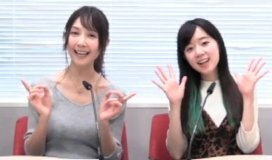 Haruka and Sawako both said they don't do much sports now. Haruka went to swimming school when she was little. Sawako wanted to go to, but she did ballet instead. They also read an advertisement for the Imoto no WiFi device. There was a new corner, "Sekai no Shawako Sekai no Kudoharu". This was a corner where they read mails from viewers who saw Sawako or Haruka in foreign countries. There will be other corners too. Sawako said she had never dyed her hair, but she wants to try. Rena (in the foreign otaku event information corner) talked about Anime Weekend Atlanta. Rena also said she was born in 1999.